Happy Pancake Day! Are you having pancakes c’est soir? I just wanted to share this amazing “Dr. 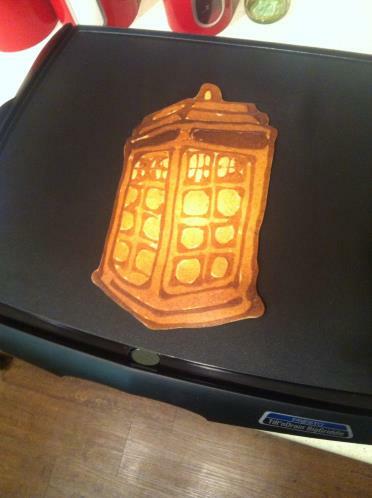 Who” TARDIS pancake that I found on Griddle Me This, a Tumblr site of pancake art! It’s enough to inspire me to put aside that Trader Joe’s pancake mix and go rogue with some pancake designs (but I suspect the execution will be shoddy …). Happy pancake making! Posted on 4, March 2014, in Food and tagged breakfast, British, Dr. Who, food, pancake, pancake day, Shrove Tuesday, Tardis, Trader Joe's. Bookmark the permalink. 2 Comments. oh my gosh! how did i miss pancake day? ?